News conferences are a double oxymoron. Pressers aren’t conferences; conferences involve back-and-forth communication. Nor do they have anything to do with news. News is neither created nor conveyed at a press conference. The one place in the world where news is least likely to happen is a press conference. If I were in charge of a media organization the last thing I’d spend money on would be a White House correspondent whose role is to sit politely holding up his or her hand, hoping like a compliant schoolchild to be called upon, begging for the privilege of being lied to. Though there was that time an Iraqi journalist tried to bean George W. Bush with his shoe. Muntadhar al-Zaidi. He’s a journalist. And that was a news-making press conference. Whatever CNN paid Jim Acosta to transcribe Donald Trump’s BS was too much. Even so, we owe Acosta for pushing the president so far that he yanked his reporter’s press pass in a fit of pique. With a brusque instruction to his despicable minister of propaganda Sarah Huckabee Sanders, Trump simultaneously exposed his authoritarian personality so that none could deny it. Even Fox News was alarmed, joining CNN’s (probably doomed) lawsuit against the president. “Secret Service passes for working White House journalists should never be weaponized,” quoth Fox’s Chris Wallace. Trump threatened to revoke more White House press passes should his journalistic stenographers displease him. The Acosta affair has convinced me of something I’ve been mulling for a long time: the president of the United States should be required to hold an hour-long daily press conference. Unless there’s a national emergency like 9/11. Then he can skip a day. Why, if press conferences are total BS—and they are—should the president have to do them? Because this a democracy. Trump is not a king. Roman emperors and generals rode through their triumphs next to a slave who whispered “remember you are mortal” in their ears lest their success convince them they were gods. Presidents should be required to host press confabs so they remember that they are not the people’s boss. Presidents are our servants. They are our slaves. They are accountable to we, the people or, the next best thing in this case, the people’s scribes. Presidents owe us answers. The death of press conferences reflects the dedemocratization of America’s politics and the rise of an imperial attitude that belies the country’s moral and economic decline. During Donald Trump’s first year in office he held just one old-fashioned solo press conference. The trend has not been a straight line but the overall track is unmistakable. Obama held seven during his first year, Bush 43 had four, Clinton 11, H.W. Bush 27, Reagan six, Carter 22. 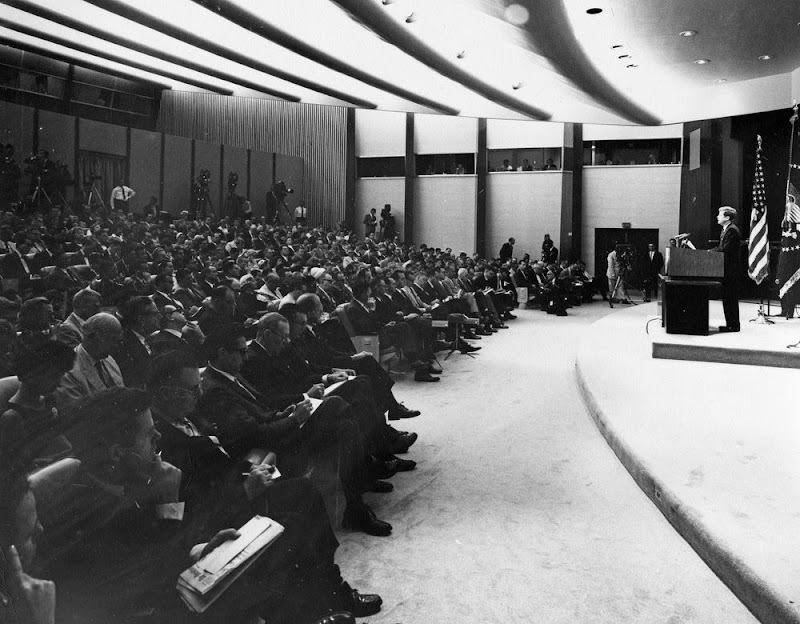 JFK held an average of 23 press conferences a year. Track them down on YouTube; the witty banter and jovial self-confidence is a sad reminder of what we’ve lost. Trump is not a king, American presidents are not kings, but even that comparison of accessibility is unfair—to hereditary monarchs. In many societies kings and queens were expected to clear their schedules for royal audiences where subjects could lodge petitions and plead grievances. These events are depicted in the alt-medieval fantasy series “Game of Thrones.” In India medieval kings, and then Mughal emperors appeared at their balcony for the Jharokha Darshan, a daily audience where the public griped, groused and begged for royal indulgence. There will be those who argue that the president is too busy to meet the press. Fortunately, there is ample proof that Donald Trump, like Barack Obama and George W. Bush before him, have more than free time to make themselves available. He, like most former presidents, play the hours-long, fake sport of golf. This entry was posted in Blog, Columns and tagged Donald Trump, Jim Acosta, journalism, law, press conferences, press pass, reporters, white house on November 16, 2018 by Ted Rall.